Richelle Mead has a talent for delivering consistently satisfying, swoon worthy novels. Indigo Spell is no exception. Sydney moves further along the path towards independence from the Alchemists and love with Adrian - I'm not saying this as a spoiler. I think we all know that's what will eventually happen. It's the journey that will surprise us. Sydney grows stronger as a character with each book. In Indigo Spell, she takes a more decisive step into seeing herself as an independent person, not merely a shell molded by the Alchemists. I almost feel like Sydney and Rose are on opposite journeys in their respective series. Sydney starts off thinking of herself as nothing and grows into her potential with the help of Adrian, Mrs. T, Jill, and their other friends. Rose starts off Vampire Academy thinking that she is capable of doing anything. It takes Dimitri, Christian, Eddie, Lissa, and the rest to show her that she can't do it all and she needs to rely on a group to be stronger. And then there's Adrian. Sigh... Whenever I'm reading a Bloodlines book all I can think is Dimitri who? Although that's unfair, because they're both great characters and right for different people. I love Adrian's passion. He knows that he and Sydney are meant for each other. He understands her reticence and not only doesn't hold it against her, but manages to slowly chip away her doubts. Fear not the lack of passion in this novel. Things between Adrian and Sydney go from cold to lukewarm to warm to HOT! There are also subplots of Sydney's awakening as a witch and her introduction to Marcus Finch. These aspects further separate her from the Alchemists. They're important to the ultimate plot arc, but a little silly at the same time. Regardless, all I care about is Sydrian! And Sydrian has much to offer in Indigo Spell. The same criticisms I've had with all of Richelle's books apply here. Chiefly that she has a tendency to tell as much as she shows. Sydney describes why she and Adrian are perfect together just as Rose did with Dimitri. Obviously, Richelle does plenty of showing too, but the telling is prominent enough to be noticeable. Also, the books are somewhat predictable. I don't care that much, because I want the series to go in the direction I imagine it and admittedly I was surprised by some parts of Indigo Spell, but I still think I can roughly outline the rest of the series. If you love Vampire Academy, you must read the Bloodlines series. Sydney is very different from Rose, but no less impressive. Adrian has the same passion as Dimitri, but in a way that will never fail to make you laugh. I can't recommend this series enough! She does both tell and show -- I don't really mind it so much because she's such a great storyteller but that's not to say I don't notice it. I haven't read but one of this series and I need to! At the risk of someone throwing tomatoes at me or something I didn't enjoy VA or Rose so I haven't started this series yet. A friend told me to give it a try though because Sydney is quite different. I also haven't met Adrian yet. "Fear not the lack of passion in this novel. Things between Adrian and Sydney go from cold to lukewarm to warm to HOT!" YES! Dude, I'm excited to read this book. I know Syndey has been going back and forth, but I think Syndey is going to change alot. I pretty much just looked at your rating. I still need to read the VA books so I'm WAY behind! But ONE day I will catch up! Despite those minor criticisms you mention about Richelle Mead, it's apparent to me that she is quite a talented writer in many other ways! I still can't believe I haven't read any of her books yet. Must get on that! I look forward to getting to know these characters, as well as the characters from the original series, so I can compare the two! 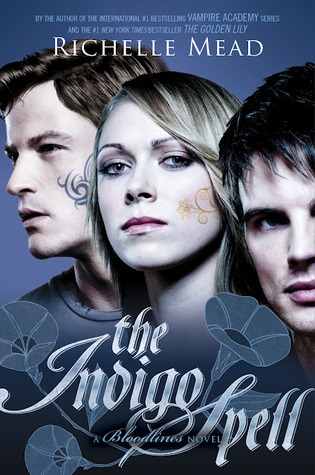 My love of the Bloodlines series has been a slow progression but since reading the Indigo Spell, I am now a huge fan! I have loved each of the characters growth - especially Sudney. I agree! I definitely prefer more showing rather than telling. Great review! I love this series though I can see what you mean about the showing and telling aspect.